I bought this book from a charity book shop, so it could have come anywhere in the timeline of the Harry Bosch series. I was quite amused that this one heralds Bosch coming out of retirement to work in the Open-Unsolved Unit of the LAPD – the last book that I read in this series was when he came out of retirement after he’d left the Open-Unsolved Unit! Bosch and partner Kiz Rider are assigned to investigate the murder of a schoolgirl many years before. The case is being reviewed in the light of DNA evidence – they hope that blood on the murder weapon will lead them to the killer. As might be expected, they witness the devastating effect the crime had on the girl’s mother and father. The mother’s life is on hold years later, waiting for resolution. The father has lost his career and is homeless – but Bosch tracks him down. He finds that the man blames himself for letting his daughter down, having been scared off from asking questions about the investigation by senior members in the LAPD. Whilst the investigation necessarily follows the car mechanic whose blood was found on the gun, the investigators know that he may not be the killer. They need to link him to the girl somehow – probing attendance at the same school or overlapping social circles in the town. Yet, none of the girl’s friends recognise the man. This Harry Bosch thriller starts with an investigation into the murder of a Chinese convenience store owner. It happens that this very man gave shelter to Harry in his shop during a riot, so he resolves to do everything he can to track down the culprit. During the investigation, the author answers a lingering question – how did Harry suddenly find himself looking after his teenage daughter, in later books in the series? The daughter, Madeline, was living with her mother Eleanor Wish in Hong Kong – they become an integral part of this story when a Triad gang decide to ward off Harry’s murder investigation by kidnapping Maddie. The book has plenty of plot twists to keep the reader’s interest, but I found it too far-fetched. Identify the location of the kidnapping from a fleeting, blurred view out of the window in the ransom video? Find Maddie in the middle of Hong Kong, a city Bosch hardly knows, given just 24 hours? No problem, and why not leave a trail of destruction behind when Bosch catches a flight home with Maddie? A nice touch is when another of the author’s characters, lawyer Micky Haller, steps in to defend Bosch from any awkward charges from the Hong Kong police. This is another in the Harry Bosch series. He teams up with a rookie detective Lucia Soto to investigate the death of a mariachi band member (who succumbed to complications from being shot ten years earlier). We later discover that Soto has connections to the area and a background investigation runs in parallel into a horrific fire that killed a number of children (and from which Soto escaped). 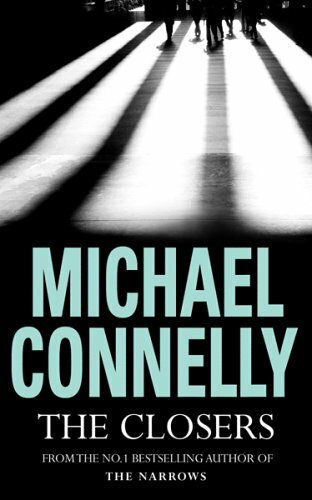 This is another Harry Bosch thriller by Michael Connelly. This one is set at a period of time when Harry is married to Eleanor, but the marriage is in trouble. A bad time, then, to be assigned to a highly sensitive case which could trigger riots in the discontented city if handled injudiciously. Bosch has to handle inter-departmental politics and work with a team headed by Chasten, his sworn enemy who has investigated his own conduct in the past. The case centres on the death of Elias, a celebrity lawyer known for taking, and usually winning, cases against the LAPD. Harry is assisted by Kizmin Rider and Jerry Edgar, but has to watch out for a high-level leak from within the case. It’s a good read, though the background case of a murdered young girl is rather harrowing.